Mark the movie ‘What If‘ at the top of my list of movies to see this year. This trailer is great. 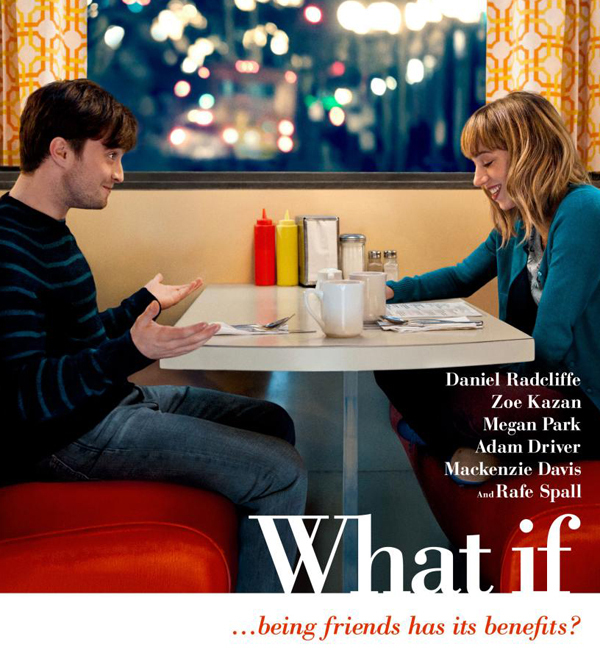 ‘What If‘ is a romantic comedy starring Daniel Radcliffe (‘Harry Potter’), Zoe Kazan (‘Ruby Sparks’), Adam Driver (‘Girls’), and Rafe Spall (‘Hot Fuzz’). It’s a story we’ve seen before, but this looks like it’s done perfectly. Basically, Radcliffe plays Wallace who falls in love with a new girl named Chantry (Kazan), but quickly finds out she has a boyfriend. So it’s kind of a wrong-place, wrong-time type scenario. Michael Dowse has directed the film, which he directed the amazing movie ‘Goon‘ recently. This looks like a lot of fun with Driver stealing the show. Every line he had in this trailer made me laugh out loud, rewind, and laugh out loud again. Enjoy the trailer. The film comes out August 1st. Official Synopsis: WHAT IF is the story of medical school dropout Wallace (Daniel Radcliffe), who’s been repeatedly burned by bad relationships. So while everyone around him, including his roommate Allan (Adam Driver) seems to be finding the perfect partner (Mackenzie Davis), Wallace decides to put his love life on hold. It is then that he meets Chantry (Zoe Kazan) an animator who lives with her longtime boyfriend Ben (Rafe Spall). Wallace and Chantry form an instant connection, striking up a close friendship. Still, there is no denying the chemistry between them, leading the pair to wonder, what if the love of your life is actually your best friend? The ensemble romantic comedy costars Megan Park and Oona Chaplin. Daniel Radcliffe’s Venture Into The ‘Jungle’ Is A Fight For Survival!!! The ‘Now You See Me 2’ Trailer Is Full of Magic!!! Prepare Yourselves For The ‘Victor Frankenstein’ Trailer, It’s a Chiller!!! This entry was posted on Tuesday, June 3rd, 2014 at 8:50 pm	and is filed under Film, News. You can follow any responses to this entry through the RSS 2.0 feed. You can skip to the end and leave a response. Pinging is currently not allowed. « ‘X-MEN: DAYS OF FUTURE PAST’ – AN EDITORIAL! !